Tinkering with Tube Audio? Vintage Vaccum tube Projects + Test Equipment for Sale. 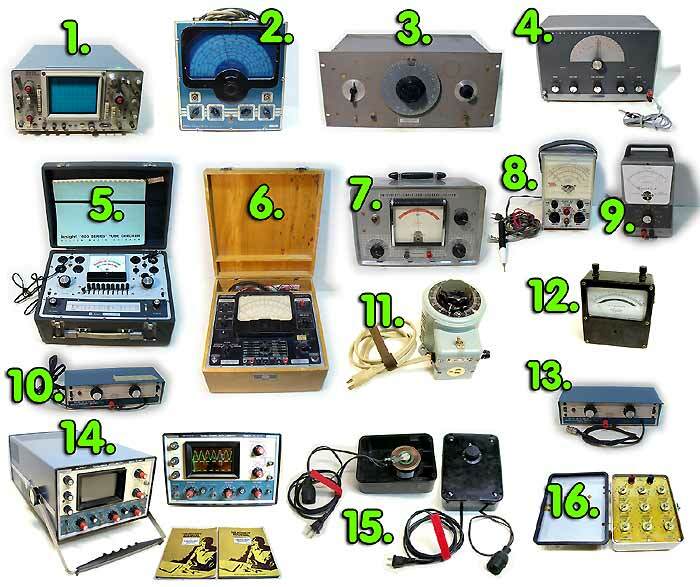 All for the Do-it-Yourselfer, hobbyist, technician or vintage electronics engineer. Projects and Test Equipment (below!). Vintage Analog Vaccum Tube Audio Projects - Create various vintage Analog Music and Audio Devices! Here you will find Vaccum tube based equipment and parts for the Do-it-yourselfer to create various analog tube driven audio devices and instruments. You will find the precious golden age parts to build: Pre-amplifiers, Microphone Pre-Amplifiers, Tube Guitar amps, Tube Tape Echos, Tube reverbs, Tube filter banks, a keyboards, organs, MIDI controllers, volume controllers and modulators. My goal is to provide really unique gear for the analog geek not to be found anywhere else! Please note: I give substantial volume discounts, if purchasing more than oen item! - Put wanted items on a list and I will quote yoru discount. Begging to be turned into a nice vintage tube GUITAR AMP or mic pre-amp! Lot: 1 US made Ampro tube amplifier chassis w/ internally mounted ALnico speaker in tolex covered wooden case with lid - a nice project for a nice piece of sweet sounding quality tube gear; includes all original tubes (and tube skirts), input / ouput kjacks and accessories as described above. Perfect for a guitar amp or Mic pre! Note: All of my items are of the highest possible quality and value to the customer. This item was carefully removed, complete with all items that it originally included, for greatest value! Price: $85.00  Buy  Secure and Easy Payment through Paypal. WARNING! As with all vaccum tube equipment: Operates on lethal high voltages and requires advanced electronics skills. 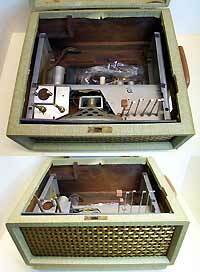 This "card amplifier" contains 3 minature type tubes and came out of a dictaphone type record recorder. So likely the circuitry already contains a tube based microphone pre-amplifier. This unit is perfect to build a mono Vaccum Tube Microphone Pre-Amplifier such as used inside of Condensor Microphone or to craft a Hi-End Mic Pre-Amp for and portable or Field Recording device. Condition: used, pulled form working equipment about 15 years ago, but not tested since then. As-IS. Price: $45.00  Buy  Secure and Easy Payment through Paypal. Use this as your basic building block for yoru own project! Description: There are 4 9 Pin tube sockets and 1 7 Pin tube socket mounted on an alluminum plate that is edged at it's sides, plus there is lots of hardware to solder parts to! currently stil la circuit, so all of the original Allen Bradley resistors and soem vintage capacitors are included to be removed by you. thsi woudl make a nice phono pre-amp chassis, Mic pre or what have you! Price: $20.00 ea. or 6 for $100  Buy  Secure and Easy Payment through Paypal. Description: Nice edges to which side walls would mount to fabricate a case with ease. There are 3 9 Pin tube sockets and these have tube skirts as well. Plus a vintage potentiometer and n 3 section electrolytic cap. Componenets to be removed by you. This would make a nice phono pre-amp chassis, Mic pre or what have you! Price: $28.00  Buy  Secure and Easy Payment through Paypal. Use this as your basic building block for a tube synthesizer or your own project - 12 9 Pin tubes mounted on a panel that coudl be cut to rack mount size! Description: Nice edges to which side walls would mount to fabricate a case with ease. There are 12 9 Pin tube sockets and 3 mor eholes cut-out to which tube sockets coudl be monted. Price: $25.00  Buy  Secure and Easy Payment through Paypal. VITNAGE Test Equipment for the Do-it-Yourselfer, technician or vintage electronics repair person, or engineer, or hobbyist. Please note: I give substantial volume discounts, if purchasing more than oen item! Description: Nice quality American made Oscislloscope. Defective: the High voltage muliplier is out, but schematic and the needed part is included (Just did not get around to installing it yet). so: NON WORKING SOLD AS-IS - NEEDS TO BE REPAIRED BEFORE IT CAN BE USED. Features: Ask and I will list more details here, but general info should be available on the net. Description: Nice quality American made Frequency Generator. Appears to be fully working. 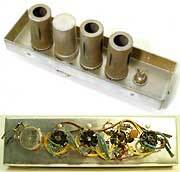 Description: A vaccum tube Audio tone generator. It outputs sine and square wave. step attenuated voltages up to 10V. I refurbished this unit and unsed it fo rmany years, but it is due again to have it's switches / contacts, etc. cleaned out / deoxydized with contact cleaner, so it may be a bit crackly intermittened, but other thna that fully works. Use as test tone generator, but it also nice as an audio tone generator for experimental music or phychoacoustic / brainwave experiements. Lot: Heathkit IG-82 Vacuum Tube Frequency Generator, schmatic. Description: Nice quality USA made tube tester. Fully restored. Tested fully working, but needs to be calibrated. Lot: Knight KG-600B Tube Tester, original chart book with settings for each tube type. Also have the schematic and other info that I can burn to CD. Lot: Precission Aparatus EV-10A VTVM, Includes a bunch of cables and probes that are in the upper compartment of the unit. 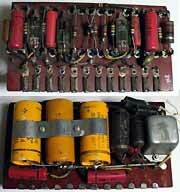 Description: This is a fine quality USA made piece of test equipment that was desinged to test capacitors in vaccum tube circuits for leakage to eliminate malfunction. I think it gwenerates high voltage pulses that can be adjuste to the range of the capacitor to be tested. A great trouble shooting too and a must for every one working on tube or othe raudio gear! Lot: Eico 232 Peka to Peak VTVM, Includes original probe. Lot: Heathkit IM-21 VTVM as described above. Price:$ 25.00 - At that price also great as a project enclosure for a tube project. Imagine to build a tube pre-amp or similar - the transformer is already there! Price:$ 20.00 - What a steal! Description: Nice USA made piece of quality test equipment made by Superior Electric Co, Bristol Conn., USA. Perfect for any test bench - with it's ample 10A power range it provides up to 1.4 KW. of adjustable AC power. also perfect fo rlighting etc. Features: In: 120V AC - single phase. Out: 0-140V AC 10A, 1.4 KVA. Power cable, off/on switch, AC outlet, fuse. Lot: Superior Powerstat Model: 116B AC Variac as shown. Works. Description: Nice USA made piece of quality test equipment made by Triplet Electric Instruments, Bluffton OH, USA. Measures AC amp up to 10A. Lot: Triplet Model: 635 AC Amp meter. Works. Price:$ 45.00 Don't want to pay that much? Have a look at item #11! Description: The perfect tool for your Audio equipment repair bench. This portable triggered dual trace 15 Mhz oscilloscope features high input sensitivity and was made in the USA. It originally came in a kit, so is fully serviceable and the instruction manuals (operation and assembly) are included to understand every nook and cranny to the minutest detail to truely own this instrument to service it yourself. It is in good working order and was repaired / overhauled. The power supply had a problem due to aged capacitors, which were replaced (original pulled parts included) and the power supply was repaired. 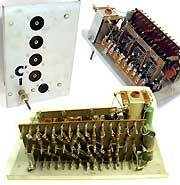 I replaced capacitors that potentially cold go bad and I also de-oxydized and lubricated controls and switches. Features: Dual Trace 15 Mhz, maximum input sensistivity: 1 mV / cm. Maximum input voltage: 400V. More details if you ask. Lot: Heathkit IO-4510 Oscilloscope 2 Original manual booklets: owners manual and assembly manual. Desrbes circuit details. Price:$ 175.00 - What a steal! Description: Vintage Audio equipment, especially tube equipment is best tested and re-vived by applying power carefully and very slowly. This unit plugs into 117V AC and allows to regulate the applied power in it's voltage form 0-117V AC. To simply plug equipment into the wall outlet that has not been used for decades very likely destroys it and even may be dangerous - so use a VARIAC! (Variable AC power Transformer). This Variac is rudemetary and in it's condition should be completed and definitely used only be used by experts who know how to handle high voltage, but the unit is easily brought up to standards by adding a grounded power chord, a fuse holder to protect against over current, a back cover to prevent exposure to dangerlous voltages, and maybe even add an AC ammeter to measure the current consumption of the equipment connected to it - that will pay off in many ways! Ths unit was made with a vintage US made Genral Electric variac. Also perfect for lighting brighness regulation without the noise that dimmers generate! Features: AC plug that plugs into any 117V AC household plug. Provides a socket in which the equipment to be tested / revived plugs in. Has a knob that regulates the output voltage with a scale that shows aproximate output voltage: 1-11 - multiply by 10. Lot: WARNING Only experienced electronics technicicas / electricians should purchase this item - or die - you have been warned! To use it as is, is dagerouns and it should be modified as described above before using it. PURCHASE AT YOUR OWN RISK! - One unit available - picture shows 2 perspectives to show all of the details. Description: This thing was made in the USA during days when athomic bombs were considered serious wapons to win a war and thrown into the athmosphere - equipment made to probably outlast even the last human for a humanless eternety - rugged and tough! Features: Set any possible resistance value know to man. the unit provides 9 switches: from x 0.1 to x 10 Meg Ohms with 10 positions for each switch each providing ten steps: form 0-10. Each switch states it's maximum current loading: form 4.5A (lowest value) to 2 mA max (highest value). There are connectors that accept banana plugs or if unscrewed, lugs to insert a wire. Probably the toughest decade box ever made - it even has a rubber seal to keep water out.